Recreational marijuana will no longer be a priority for Canada’s criminal-justice system. This week the Senate passed legislation that will make the country the second in the world to strictly regulate weed—but technically legalize it—beginning in October. The first was Uruguay, so Canada is the first major economy, and an experimental model for the rest of the world that will inform policy for decades to come. Details of the regulatory framework remain to be seen, The New York Times reports, but a few elements stand out as health safeguards: There will be “strict limits” on advertising, and marijuana will “likely be sold in uniform packages that carry health warnings as their only decoration,” and candies and other edibles will be banned. Later that night at a bar down the street from his office, though, I found myself on stage moderating a much heavier discussion with two affable young men who turned out to be very concerned about legalization. They made a passionate case that the state wasn’t ready to regulate such an industry, and that a public-health crisis loomed—once what they called “Big Marijuana” started marketing and profiting in the ways of so many other politically influential entities. I felt irresponsible as a doctor for not having considered how slippery the slope could become in the longer term. Their argument, essentially: The streets were quiet now, but in short order, Big Marijuana could be the next Big Tobacco or Big Alcohol or Big Soda. The forces of capitalism would see the streets flooded with weed and weed-laced products, ever more potent and ever more desirable. Marketing messages would teach us that daily marijuana use was good or even necessary. Once the industry got the money and lobbying power it needed, regulations would grow more and more relaxed. As regulation and enforcement waned, the few storefronts that didn’t end up peddling THC in some form—edible, smokable, vape-able, topical, insertable—might feature vending machines or ads for weed. There could be enormous neon billboards with cartoon characters selling weed candy at amusement parks. And it won’t just be about the kids. People in grocery-store checkout lines who had no prior interest in weed would opt to pick up a THC-infused granola bar, and then they would start buying one every day. Politicians who attempted to rein in the chaos would be pilloried and ousted by Big Marijuana lobbyists. Though there is precedent for such concerns, from fossil fuels to health insurance, this has yet to happen with marijuana. The rollout in Colorado was far from perfect, but many retroactive regulations were able to be implemented to address ongoing issues like the use of home-growth practices and pesticides, selling and transporting across state lines, driving while high, driving while not-high-but-also-not-entirely-sober, standardization of dosing, and labeling. In 2014 I purchased THC-laden candy that looked identical to Sour Patch Kids, and the recommended dose was half of one piece of the candy. The potential for confusion and harm there was obvious. By Freedman and others’ admission, the Colorado rollout was undertaken without an ideal evidence base, and without precedent to inform plans for all of the complications that would arise. It was and remains an experiment, and Canada’s will be as well—inevitably imperfect, but promising because the country is better positioned to stay in control of the substance than the United States. Increasing the number of occasional consumers isn’t necessarily a health concern—especially if consuming marijuana replaces drinking alcohol or using other drugs. But there is concern about perverse incentives in the industry, as have been seen over the decades with tobacco and alcohol, where roughly 80 percent of the product goes to 20 percent of the users. For these people, overuse is somewhere between a concern and a serious problem. Right now the U.S. marijuana industry is a convergence of markets, where the legal industry is still mostly siphoning business from the illegal industry. But once the black market is tapped, there can be incentive to grow that 20 percent. It’s most profitable to cultivate lifelong, heavy users. In the cases of tobacco and alcohol, the strategies were to get people to use more or to start using earlier. So the critical balance of effective marijuana policy is to incentivize producers to make enough to meet demand, but not to substantially grow the market. In Uruguay, where marijuana went on sale at some pharmacies last year, the government-controlled supply chain has not met demand, and a national shortage has kept the black market in business. In Canada, the supply will be privatized but regulated by the federal government, and the states will be involved in retail to various degrees. Academically, this will allow comparisons between provinces that impose tighter regulations on advertising and distribution—doing more to minimize profit incentives than others. The effects on demand, crime, and health outcomes will be cited in future policies around the world, on an ever more informed march away from prohibition. A lack of insurance coverage. A common talking point on the right is that health care and health insurance are not equivalent—that getting more people insured will not necessarily improve health outcomes. But according to Blumenthal: “The literature on insurance demonstrates that having insurance lowers mortality. It is equivalent to a public-health intervention.” More than 27 million people in the United States were uninsured in 2016—nearly a tenth of the population—often because they can’t afford coverage, live in a state that didn’t expand Medicaid, or are undocumented. Those aren’t problems that people in places like the United Kingdom have to worry about. Administrative inefficiency. “We waste a lot of money on administration,” Blumenthal said. According to the Commonwealth Fund’s most recent report, in the United States, “doctors and patients [report] wasting time on billing and insurance claims. Other countries that rely on private health insurers, like the Netherlands, minimize some of these problems by standardizing basic benefit packages, which can both reduce administrative burden for providers and ensure that patients face predictable copayments.” In other words, while insurance coverage in general is great, it’s not ideal that different insurance plans cover different treatments and procedures, forcing doctors to spend precious hours coordinating with insurance companies to provide care. Underperforming primary care. “We have a very disorganized, fragmented, inefficient and under-resourced primary care system,” Blumenthal added. As I wrote at the time, in 2014 the Commonwealth Fund found that “many primary-care physicians struggle to receive relevant clinical information from specialists and hospitals, complicating efforts to provide seamless, coordinated care.” On top of a lack of investment in primary care, “we don’t invest in social services, which are important determinants of health” Blumenthal said. Things like home visiting, better housing, and subsidized healthy food could extend the work of doctors and do a lot to improve chronic disease outcomes. How Will Trump Lead During the Next Global Pandemic? The next global epidemic is likely around the corner—and no amount of U.S. retrenchment from globalization will halt that outbreak at the U.S. border. “All those things would lead to the loss of many lives in the event of an epidemic in the United States, where we need the public not to trade in conspiracy theories, not to believe that the news was fake, but to respect scientific expertise,” said Klain, a veteran Democratic operative who served in both the Clinton and Obama administrations. Klain added that Trump’s isolationist mindset has led to the United States pulling back from its leadership role in global health crises, which, he said, “is ... going to be a serious threat to our security.” Klain called Trump’s policies and views “xenophobic, if not racist,” leading to the blaming of immigrants and foreigners for problems that need public-health interventions. Klain specifically cited Trump’s tweets in the midst of the Ebola outbreak when he advocated that American health-care workers who had contracted the disease in Africa be barred from returning home. “People that go to far away places to help out are great—but must suffer the consequences!,” Trump tweeted at the time. Global health-emergency preparedness has traditionally been a bipartisan issue. Klain cited President George W. Bush’s much-lauded PEPFAR initiative, which committed the United States to taking a leadership role in tackling HIV/AIDS in Africa. During the 2014 Ebola outbreak, a Republican-controlled Congress authorized more than $5 billion to fight the outbreak. Klain identified several large gaps in U.S. preparedness for the next global outbreak. In 2016, 64,000 people died from drug overdoses in the U.S., most of them due to opioids. That’s more than the number of Americans killed in the wars in Vietnam and Iraq combined. Three factors led to those numbers, Nora Volkow, the director of the National Institute on Drug Abuse, a part of the National Institutes of Health, said at the Spotlight Health Festival, which is co-hosted by The Aspen Institute and The Atlantic. First, the epidemic was started by a healthcare system that sought to minimize pain and suffering. Physicians were taught that those with pain wouldn’t get addicted to pain medication, she said. “Unfortunately, those beliefs were completely wrong,” she said. What it resulted in was “an overprescription of opioids,” Volkow said. Second, Volkow said, this overprescription coincided with a massive flood of heroin in the 2000s from Mexico. Deaths from heroin overdoses had been consistent for years—about 2,000 people died of overdoses from the drug each year, but in 2016 that number spiked to 15,000. Thirdly, she said, heroin began to be laced by drug dealers with synthetic opioids, which are not only relatively easy to produce, but also stronger than heroin. Fentanyl, for example, is 50 times more potent than heroin. Carfentanil, another synthetic opioid, is 500 times more potent than heroin. Both synthetic opioids are pain relievers, but are also sold illegally as drugs. They are so powerful, Volkow said, that they get into the brain quickly. First responders are often unable to save those who have overdosed. But what is it that made America so vulnerable to the proliferation of illicit opioids? One factor is the gradual decline of economic power in parts of the country that were once the lifeblood of the economy. “We need to recognize the social [factor] of the opioid crisis,” Volkow said. Indeed, 2 million Americans are believed to be addicted to prescription or illicit opioids. The Trump administration has made tackling the crisis a centerpiece of its domestic policy agenda, designating it as a national health emergency. Many of the most-affected areas, which are also some of the most impoverished places, voted heavily for Trump in 2016. These areas tend to be rural, poor, and overwhelmingly white, which brings up another aspect of the opioid crisis: It has disproportionately affected white Americans. Dr. Andrew Kolodny, co-director of the Opioid Policy Research Collaborative at Brandeis University, told NPR last year that one reason for this is unconscious bias on the part of doctors who prescribe painkillers. Arkansas just became the first state to implement work requirements for its Medicaid program. Similar Medicaid waivers have been approved for three other states, and seven more are pending, spurred in part by the Trump administration’s guidance last year. Now, if able-bodied adults on Arkansas’ Medicaid rolls don’t go to work, study, or volunteer for 80 or more hours a month, they will lose their health insurance coverage in three months. A study by the Urban Institute in May estimated that, this year alone, 22,000 people, or 8 percent of Arkansas’ Medicaid population, could be subject to the work requirements and are not working. The work requirements reflect the view, among some conservative health-policy experts, that people should be encouraged to get jobs and get off Medicaid. Many liberals, meanwhile, feel that revoking health insurance is a harsh punishment for what could amount to a lack of skills, transportation, or knowledge. Three consumer advocacy groups, in fact, sued the Trump administration to stop the work requirements. “The inevitable coverage gaps from Arkansas’ work requirements and coverage lockouts will worsen beneficiaries’ health, which is one reason why major physician organizations oppose work requirements in Medicaid,” wrote Judith Solomon at the Center on Budget and Policy Priorities. I recently spoke with Cindy Gillespie, a former health care advisor to Mitt Romney and the current director of the Arkansas Department of Human Services, about what the work requirements do and don’t mean for Arkansans. We met at the Spotlight Health Festival, which is cohosted by The Aspen Institute and The Atlantic. A lightly edited transcript of our conversation follows. Olga Khazan: Do you have any concerns that the work requirements on Medicaid will cause people to lose coverage, and if not, why not? Cindy Gillespie: We’ve started our work requirements with the 30- to 49-year-old group. Within the 30-to-49-year-old group, we’ve exempted out anybody with a child in the home, anyone who is caring for an incapacitated person, anyone who has a short-term incapacitation, drug, and alcohol rehab. We end up with a small population of able-bodied adults who are working less than 80 hours a month and, who, as best we can tell, are not full-time students or not in any sort of activity that would prevent them from being able to get into job training, job search, education, some kind of GED, all of these different type of areas. Our focus is to get those individuals … get them working with the Department of Workforce Services, career education, someone who can help them identify what their barriers are to actually looking for a job, getting a job, engaging in the community, doing volunteerism, doing job search, all of those sorts of things. Our focus is to really concentrate on those individuals and see if we can move them further up the economic ladder. After three months of non-compliance, a person will lose their coverage for the rest of the plan year. Not permanently. If the individual does not, for some reason, engage in that period, they can come back into the program in the next plan year. Khazan: Why not just do the engagement into the programs and not have the stick of the losing coverage? Gillespie: Last year we tried a work referral, where we tried to refer everyone in the program to all the different services that were available. We had an extremely low take-up rate. People just didn't pay attention. This is actually engaging, not just the individuals, but it is engaging an entire support network around them. For example, the insurance carriers, they have a vested interest in that person now because [if] that person rolls off the insurance plan, then that carrier won't be getting paid for them anymore. They have a vested interested in putting their network to work, reaching out and getting with the person. The same with all of the groups that work around the state with different individuals. They all have a vested interest now in helping make sure that the individuals do, in fact, get into the system. Our department of Workforce Services actually sent all of our Arkansas Works beneficiaries a letter and told them ... We want to help you get, to education, to job training, to job search, to what you need. You are seeing a lot of engagement that I don't think you would see unless everybody had got really excited and involved in the program. The media even in our state, they were great at doing sessions with different advocacy groups this week. Helping them understand how this works, what to do, that got covered by the media. Lots of things are letting more people know. At the end of the day all that creates more knowledge, not just from those who have the work requirement but among all of those who don’t. Now they are going to see more and hear more about the services that are available. We find, constantly, people don’t know of the services that are available. When you tell them, they don’t pay attention. Now we are hoping they will pay attention and take advantage of the services. Khazan: Do you anticipate that a lot of people will lose coverage as a result of the work requirements? Khazan: So you don’t anticipate anyone losing coverage? Gillespie: I can’t say that, obviously. We have a massive amount of churn that goes on. I think last month we had about 5,000 people that came off of Arkansas works, due to some accuracy efforts we have going on. There is a massive churn that goes on in these programs, there will be people who roll on, there will be people who roll off. I won't know until September whether or not, there’s any that actually lose their coverage for the remainder of this calendar year because they did not do anything over the next three months. Khazan: Is there a concern at all, that if someone does lose coverage as a result of this change, that will actually make them less likely to work or to do some of these activities that you are trying to encourage? Gillespie: Your question presupposes that someone who is working and meeting their requirements loses their coverage. If they are working, they are not going to lose their coverage. Khazan: Is there a possibility that this rule could get expanded to include people who are of different ages; or who have children in the home; or some of other populations that are excluded for now? Gillespie: That would be way down the road. We are rolling this out over two years, this year is the 30-49 year olds. Next year is 19-29 year olds. That is as far as the program has been set up at this time. We are just starting with one group, working and focusing on them, learning lessons from that and then next year we will take the next group. Khazan: They are supposed to show their progress online, through an online form. Is that still the case? Khazan: What happens to people who don’t have internet access at home? Gillespie: If there is someone who can not access the portal, either because of what you said or because perhaps they can’t read and write ... which is why we really want to get a hold of them and get them into educational programs that can help them. Let’s just say they have a reason they can’t; we have set up a program of registered reporters, so that they can have someone else put it in for them. They can call someone who is a registered reporter and they can put it in for them. They don't have to go somewhere. The insurance carriers have set up their operations to have registered reporters, so that when they reach out to people, if they haven't been able to get in to the portal, they can actually help them over the phone do that. We also have places they can go, not just our offices that have set up kiosks, but all over the state. The access is there, if someone has something to report. Khazan: Did the state consider other mechanisms to get people engaged in some of these work or educational programs, other than losing their health insurance coverage? Like paying a slightly higher tax rate or some other penalty? Gillespie: You are talking about individuals whose income is less than $800 a month. They are not paying taxes. Khazan: Other than taxes, no other mechanisms were considered? Gillespie: No, that is the primary mechanism that you have because they don't pay premiums, they don't pay copays, they pay no cost at all. We have tried already to require a very, very, very small payment towards premiums. Most of the individuals did not do it. This is something people can do even if they don't have money. It will help them get to where they do have money. That's our hope. “That is the cost of gun violence,” Clark, who is the president and CEO of ShotSpotter, a company whose technology uses sensors to identify the sound of a gun being fired, said Friday at the Spotlight Health Festival, which is cohosted by The Aspen Institute and The Atlantic. Clark noted that although much of the focus on gun violence in the U.S. is on mass shootings, they account for about 1 percent of all shooting deaths. The overwhelming majority of gun crimes are committed with illegally obtained firearms. Not only that: very few individuals are responsible for most of those gun crimes, he said. But the vast majority of persistent, ongoing gun violence goes unreported by residents who live in communities that are often poor and under-served by police. Clark’s company’s technology is used in 100 U.S. cities, as well as in Cape Town, South Africa. It costs cities an annual subscription of between $65,000 and $85,000 per square mile per year. Smaller cities can get the service for about $200,000, but for larger ones like Chicago, which uses ShotSpotter to track gunfire across 100 square miles, the cost is about $5 million annually. The price is worth it, Clark said, because “the downstream consequences of what it means to be traumatized” are far higher. “If you realized that there was a child that had to go to bed to the sound of gunfire, wake up to the sound of gunfire, maybe walk across yellow tape on the way to school, I think we would think about this issue very differently,” he said. ShotSpotter’s technology provides police departments with a comprehensive picture of firearms use in a community—and it has been used by prosecutors to convict suspected shooters. Clark himself says, though, that the technology helps answer a basic question: Is a community deserving of a police response? 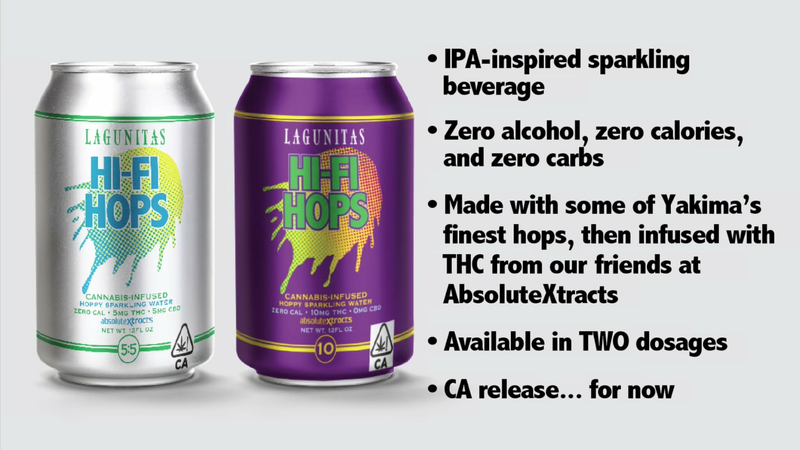 Forget Beer - Lagunitas Is Coming Out With Cannabis-Infused Sparkling Water! What a time to be alive! 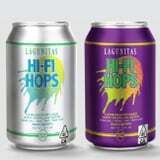 Lagunitas Brewing Company announced a new product that will excite both cannabis enthusiasts and sparkling water-lovers: an IPA-inspired sparkling water infused with THC. Available July 30, Hi-Fi Hops will first roll out to dispensaries throughout California for adults 21 and over to enjoy. The childproof can will come in two dosages - one with 10mg of THC and one with 5mg of THC and 5mg of CBD - infused with sun-grown cannabis from AbsoluteXtracts. The best part? You get a buzz, minus the guilt. Hi-Fi Hops contains zero alcohol, zero calories, and zero carbs. It really makes for the perfect beer alternative as it's also gluten-free. 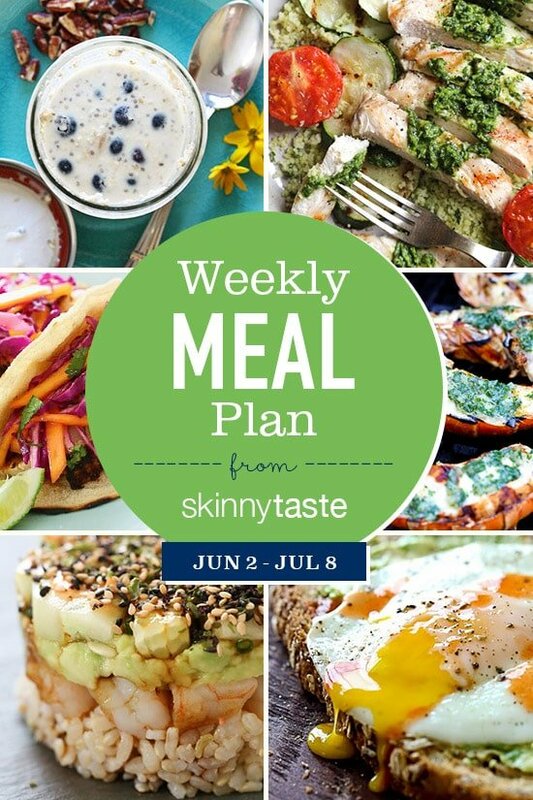 Yep, we're already planning to buy in bulk. And if you're wondering what it'll taste like, the Northern California-based brewery promises a "bubbly, aromatic, bitter, fruity, and herbaceous" sparkling water in its press release. We're hoping "herbaceous" doesn't translate to "subtle weed notes," but I guess we'll just have to find out ourselves. Either way, we can't wait to get our hands on these! According to celeb trainer Gunnar Peterson, the secret to awesome abs is "working consistently, working in different planes of motion, and adding weights to your abdominal work." Take this advice to heart - here are a handful of exercises that put these principles into action using a set of dumbbells or a medicine ball. Incorporate a few of these exercises into your next workout to really kick your abs into action. Holds Up To 800 Tablets or Capsules! At most independent coffee shops, you come for a cup of coffee and a bit of light conversation. But at Chicago coffee bar Sip of Hope, you can expect a lot more than that. The world's first coffee shop that gives 100 percent of its proceeds to mental health education and proactive suicide prevention, Sip of Hope also certifies all of its employees in Mental Health First Aid, and they're available to talk with any visitors who need to unload. Sip of Hope is the perfect space for breaking the silence around suicide and raising the visibility of mental health resources in our community. We get it! Life is hard and some days we need more than a cup of coffee to get us through the day. We need to remind ourselves, that despite the things we've been through, it's OK to feel pain, it's OK to talk about it. The biggest obstacle to preventing suicide is silence. We as a community can start the conversation about mental health, we are in this together. Prevention starts with a conversation, and the conversation starts here. Sip of Hope's proceeds go toward Hope For the Day, an organization focused on suicide prevention outreach and erasing the stigma surrounding mental health conversations. When you step into Sip of Hope, you'll see a large "It's OK not to be OK" on one wall, along with other inspirational art and mental health resources available for anybody to use. Plus, according to visitors, the coffee and tea are delicious! Ahead, check out photos from the inspiring coffee bar and you'll find yourself hoping that more businesses adopt a similar model. After all, we're all in this together! You might think beer when you think backyard barbecue, but it's time to move beyond the can. It's time to think punch bowl. And not your grandma's sherbet and ginger ale sparkly punch either. 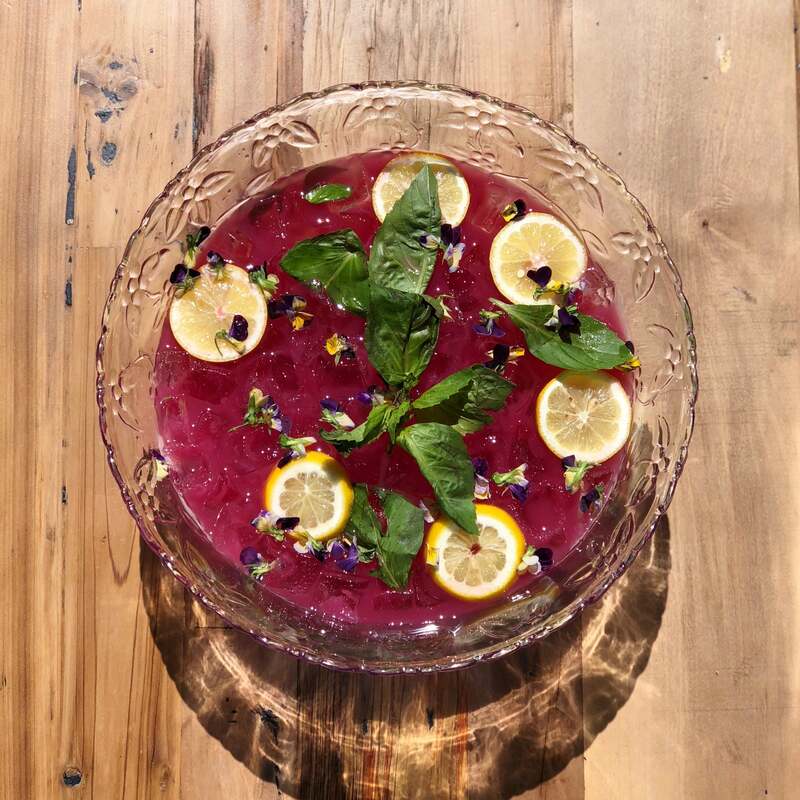 We're talking punch as a fun, easy way to create a signature cocktail for your next event. But why not keep it healthy, too, and use juice as the base of your bevvy? No need to juice your own; this cocktail created by Serious Leisure starts with the Roots 3 blend from Pressed Juicery. Roots 3 mixes beet, apple, and lemon juices with spicy ginger added to bring some heat. It's the perfect canvas for tequila. 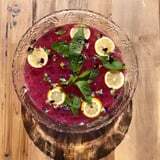 This recipe uses edible flowers (Johnny Jump Ups) and fresh basil to dress up the punch, adding even more nutritional value. Cheers! Add all liquid ingredients to an extra large shaker. Shake and pour into large punch bowl. Garnish with fresh basil, lemon wheels, and optional Johnny Jump Ups. The federal government recommends that every week we all do “muscle-strengthening” activities at least twice, along with 150 minutes of “moderate intensity” aerobic physical activity. However, only about 23 percent of U.S. adults actually manage to work out this much during their leisure hours, according to a new CDC report released Thursday. And, the CDC found, the percentage of people who get enough exercise varies greatly by state, from a low of 13.5 percent of adults in Mississippi to a high of 32.5 percent in Colorado. 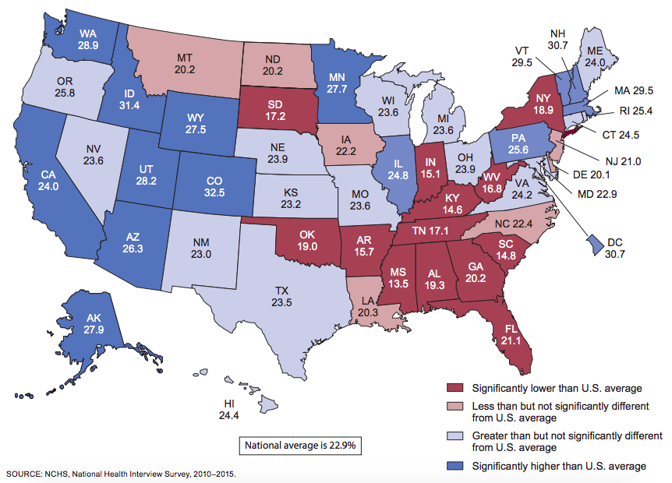 In 13 states—Alabama, Arkansas, Florida, Georgia, Indiana, Kentucky, Mississippi, New York, Oklahoma, South Carolina, South Dakota, Tennessee, and West Virginia—a significantly lower percentage of adults got enough exercise than the national average. Most of these states are in the southeast, which is sometimes referred to as the “Stroke Belt.” As Claire Suddath once wrote for Time, some areas of the southeast U.S. lack public transportation options and even sidewalks. It’s also too hot to exercise outside much of the year, unlike in healthier states such as Colorado or Minnesota. Also, people who are already in poor health—as people in places like Kentucky disproportionately are—tend to exercise less, the CDC notes. Meanwhile, in 14 states—Alaska, Arizona, California, Colorado, Idaho, Illinois, Massachusetts, Minnesota, New Hampshire, Pennsylvania, Vermont, Utah, Washington, and Wyoming—and the District of Columbia, a significantly higher percentage of adults exercised enough, compared to the national average. Several of these states are in the mountainous, activity-filled west, but others are simply wealthier than average. According to the CDC, “people in professional and managerial occupations” are more likely to get enough exercise. Although exercise is not the best way to lose weight, people who exercise tend to have a lower risk of chronic disease, disability, and premature mortality. The differences in physical activity among the states is yet another example of how where you live determines how healthy you are. Universal Nutrition Animal Wrist Wraps - Necessary Equipment for Powerlifters, Heavy Pressers & Veterans of the Iron Game!